As far as I am concerned, this movie started out with two strikes against it. First, it's a vampire movie and I hate vampire movies (with one exception). Especially Dracula vampire movies. Second, this is a movie from famous British studio Hammer Film Productions, and I am not a fan of their movies at all. A bunch of old guys have set up some kind of Dracula cult, of which most of the members are young 70s guys in fur jackets, riding motorcycles. We begin the movie with this one guy waking up in the cult headquarters and he makes a daring escape, winding up back at some kind of 1970s British X-Files organization, where he has just enough time to pass over his information before dying. It turns out that a bunch of VIPs, ranging from politicians to rich guys, are trying to revive Dracula so they will have even more power. It is up to a bunch of secret agents and also Professor Van Helsing to fix all of this! Count Dracula and His Vampire Bride was originally titled The Satanic Rites of Dracula, but you know how we Americans are with our intense fear of satanic rites. It's too bad, because there are a lot of satanic rites in this film(the vampire bride is kind of an afterthought at the end of the movie) and I'm a big fan of movie titles that are honest, and also serve as concise plot summaries. They should have called this Dracula 1974... this would have been awesome because this movie is the sequel to a movie called Dracula AD 1972! 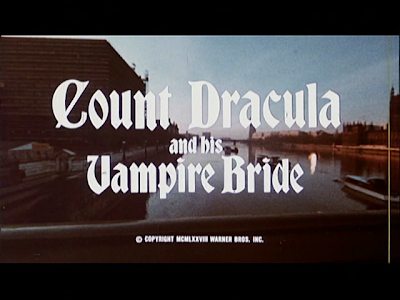 Sadly, this is not the Dracula movie that is going to win me over. It's boring and filled with your typical hissing vampires and even the cult aspect is not interesting. I will hand it to Hammer though, they are really good at making excellent looking films on low budgets. But then again, what kind of budget do you need for a vampire picture? Just throw a cape on a guy and tell him to hiss at everything. Most of your money is going to go towards getting those blood capsules so your vampire can bite people and syrupy blood can trickle out. 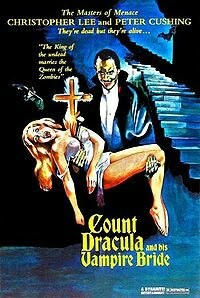 I've heard that Dracula AD 1972 is pretty excellent in how ridiculous it is, but this movie has none of that (maybe they decided to rein it in a bit this time), so I really can't recommend it unless you just really are in love with the concept of Dracula being resurrected and glaring at people.